This is a fabulous transferware ointment pot or crock, circa 1880. 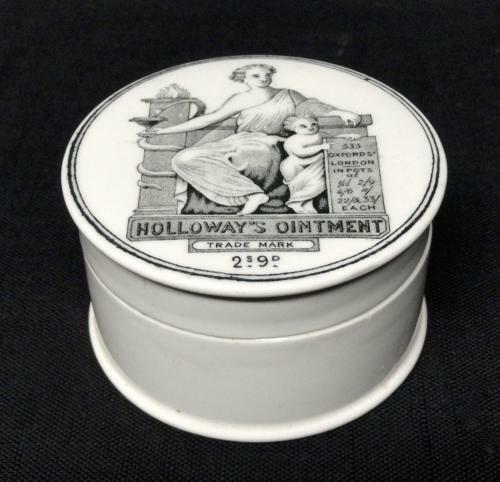 It once contained Holloway's Ointment, advertised as the cure for gout, rheumatism, inveterate ulcers, sore breasts, sore heads, bad legs, and whatever else ails you! This ointment was made and sold by "Professor" Thomas Holloway, the most well known of all the "snake oil" salesmen in Britain. The product was shear quackery, but the Professor was highly successful in aggressive advertising schemes before he died in 1883. The crock was made in the Staffordshire district and is transfer printed in black. In addition to the name of the product, the pot contains the trademark image of a woman holding a cup with a a snake drinking out of the cup. At her left knee is a small child. The pot measures 3 1/8 " wide and stands 1 5/8 " tall. It is in great condition with some chipping off the inside of the base. The piece will make a great addition to any collection of transfer printed advertising wares or quack medicines .